The use and banking of biological material for research or clinical application is a well-established practice. The material can be of human or non-human origin. The processes involved in this type of activity, from the sourcing to receipt of materials, require adherence to a set of best practice principles that assure the ethical and legal procurement, traceability, and quality of materials. 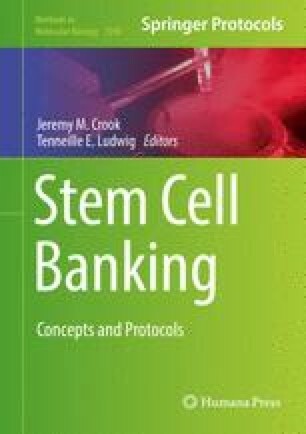 The author would like to thank the Medical Research Council (MRC), the Biotechnology and Biological Research Council (BBSRC), the Technology Strategy Board (TSB) the EU Framework 7 programme projects; Embryonic Stem cell-based Novel Alternative Testing Strategies (ESNATS), Stem cells for relevant efficient extended and normalized toxicology (SCR&TOX), ToxBank and the International Stem Cell Forum for supporting the activities of the UK Stem Cell Bank.